Photo by Adrian Moser, Bloomberg. A Bloomberg News analysis of about 80 companies in the lithium-ion battery business shows the technology’s ascent rippling through a global web and boosting providers of raw materials and components—suppliers that, in several cases, predate the 1908 introduction of Ford Motor Co.’s Model T.
“Everyone has to increase scale in everything: from the mines to the chemicals, to the battery makers,” said Sam Jaffe, managing director at Boulder, Colorado-based Cairn Energy Research Advisors, an industry consultant. The beneficiaries include Belgium’s Umicore SA, which started in 1805 as a zinc miner and evolved into a chemicals-to-electronics powerhouse that is outpacing the benchmark Stoxx Europe 600 Index this year. Japan’s Asahi Kasei Corp., which traces its origins to 1922 as a maker of rayon, dominates the market for the separators that allow an electric current to pass through the battery; shares are outperforming the Topix index. In the U.S., industrial linchpin DowDuPont Inc. already sent its products to Mars inside a NASA rover and is now gaining sales by focusing on lubricants, adhesives and plastics that boost the performance of EV batteries. Companies in the sector have the potential to capitalize on huge gains in demand during the next two decades, according to BlackRock Inc., which manages about $6 trillion in assets. The New York-based manager last month opened a fund focusing on those companies poised to benefit from the shift to electric and autonomous vehicles, including raw-materials suppliers, component makers and technology providers. Still, there are long-term risks that parts of the supply chain will be commoditized, denting the prospects for returns, said Tom King, chief investment officer at Sydney-based Nanuk Asset Management Pty., which holds battery-sector shares, including Asahi Kasei and Panasonic Corp., a supplier to Tesla Inc. Margins are being squeezed as cell manufacturers lower prices to build market share ahead of the expected boom. Lithium-ion battery prices are forecast to fall by about half through the mid-2020s, according to BNEF. Yet that may not be so bad, since it’ll help most passenger EVs achieve cost parity with combustion-engine models by 2030, making the choice between the two a little easier for buyers. A researcher at Asahi Kasei Corp.’s laboratory south of Tokyo is credited as one of the inventors of the lithium-ion battery in the 1980s. More than three decades later, it’s an innovation that’s still helping the company find new sources of revenue. The manufacturer of a sprawling range of products—from medicines to fabrics—dominates the market for separators, the component that keeps the current flowing between a battery’s cathode and anode. Work on separator technology started even earlier: in the 1970s, said Akira Fukuda, a senior managing executive. “It remained an obscure product for more than 10 years,” he said. That changed with the arrival of rechargeable batteries, and then demand skyrocketed with the proliferation of consumer electronics such as camcorders, portable music players and smartphones. The arrival of EVs promises a more dramatic reshaping of the market, prompting Asahi Kasei to consider expansions in Europe and China and to seek almost a doubling of its output by 2020. “There is still room for growth for parts makers,” Fukuda said. Investors are adding the company and competitor Toray Industries Inc., betting they’ll prosper as vehicle fleets electrify. “The EV-related business offers the prospect of stable growth,” said Yukihiko Fukunaga, an analyst at Tachibana Securities Co. in Tokyo. That’s happening all over the chassis. Asahi Kasei is producing materials that will help make EVs lighter and more efficient, and it’s developing a raft of new technologies such as sensors to track a driver’s vital signs. About 30 innovations are being showcased in a concept sports car called the AKXY that has been displayed publicly. The company also is making acquisitions in the auto sector, including this year’s $700 million purchase of Sage Automotive Interiors Inc., based in Greenville, South Carolina. China’s push for cleaner air and fewer oil imports helped Fujian-based Contemporary Amperex Technology Ltd., or CATL, become the biggest electric-car battery maker in the world within a decade of opening its doors. Founder Zeng Yuqun is an engineer who spent most of his career working on lithium-ion batteries for consumer electronics. The company’s rapid rise has a lot to do with China’s generous government incentives for drivers buying non-gasoline vehicles. Carmakers seeking inclusion in the subsidy program are choosing domestic battery suppliers because of concerns that models built with foreign brands under their chassis will be declared ineligible. It also has to thank BMW AG, which first chose CATL to develop batteries for its EVs in China, helping establish a high bar for quality and technology. CATL held an initial public offering in Shenzhen in June, and shares vaulted 44 percent the first day. CATL is using the IPO proceeds to help build a 24 gigawatt-hour factory near its headquarters. It’s also partnering with SAIC Motor Corp. on a 36 gigawatt-hour plant in Jiangsu province. The company isn’t content to stay in China, with Zeng saying globalization is key for its next growth phase. CATL plans to establish a manufacturing site in Germany after securing a $4.7 billion deal from BMW to buy battery cells. It also has sales offices in the U.S. and Japan. While its products helped NASA explore the surface of the red planet, the U.S. chemical giant also is generating revenue from Earth-bound vehicles and readying for a major opportunity as hybrid and electric fleets expand. 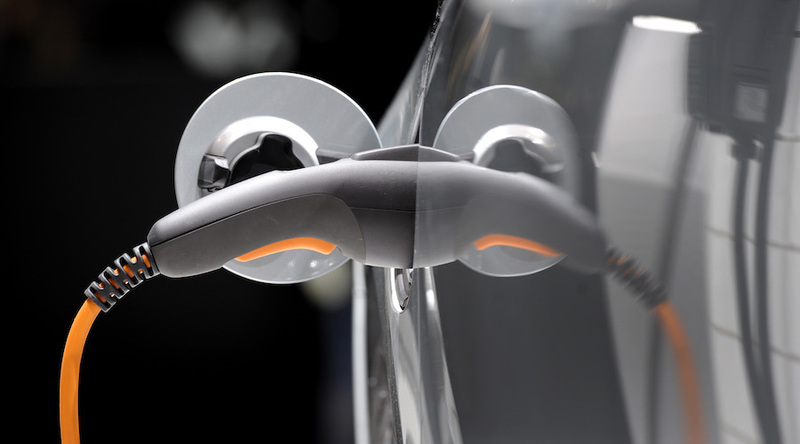 Sales are growing at a “double-digit” rate, said Eugenio Toccalino, global marketing director for the transportation and advanced polymers business, and DowDuPont forecasts the EV sector to grow “exponentially” during the next decade. The conglomerate is focusing on products that can help boost vehicle battery performance, reduce weight and lower costs. An innovation center that opened last month in Silicon Valley is seeking to deepen ties in the sector and showcase technologies suitable for electric, hybrid or autonomous vehicles. Injection-molded plastics can be an alternative to metal casings and help lower the overall weight of batteries, as can deploying industrial adhesives to seal packs together. Sheets of film can act as flame barriers inside batteries to improve safety, while Kevlar fibers—a material used in body armor—can be added as a shield to protect the components from the impact of collisions. “We have solutions that enable those batteries to be lighter, to be more durable, to be higher performance,” Toccalino said. The DuPont family’s ties to the auto industry date back more than a century and include the production of DuPont-branded cars and a decades-long company investment in General Motors Co. Both Dow and DuPont exited businesses producing battery components, including electrolytes and battery separators, prior to their merger, seeking to focus on “enabling technologies,” Toccalino said. Dow in 2013 sold its stake in a venture manufacturing lithium-ion packs, including in the U.S. Toccalino’s unit will be part of the new DuPont when it returns to being an independent company next year, as the current merged entity splits into three, smaller firms. Belgium’s Umicore SA is the standout performer in cathodes, the mission-critical chemical compounds that determine how far EVs can travel between charges. The company is reaping the rewards after betting hundreds of millions of euros on battery materials and EVs as the technology began to evolve. A long-time supplier of catalysts used to cut pollution from diesel exhausts, Umicore’s biggest profit driver is now battery materials, where earnings almost doubled in the first half of this year. By 2020, Umicore is expected to account for about 40 percent of the total profit generated in the battery-materials industry—300 million euros out of a predicted 760 million euros, said Adam Collins, an analyst at Liberum. By 2025, that share should increase to an estimated 800 million euros out of a total 1.3 billion euros. “It’s not only about the product you deliver, it's also about your process technology: to have the ability to scale up fast, massively and cost-efficiently,” Chief Executive Officer Marc Grynberg said in an email. The company says it supplies “almost all” global manufacturers of cells approved for cars. Umicore started as a zinc-and-nickel refiner in 1805 when Napoleon Bonaparte awarded mining rights in what became modern Belgium. It has a more than 100-year heritage in the Democratic Republic of the Congo and in recycling and refining products containing cobalt—now a key ingredient in EV batteries. Its materials are in one of every five lithium-ion batteries ever made for portable electronics, including Sony Corp.’s Walkman, the company said. Faced with Asia’s dominance in batteries and Tesla’s advances in the U.S., Volkswagen AG is among the automakers calling for European companies to help establish a local battery industry for their own EVs. Umicore could be in the pole position to spearhead any such project after announcing spending of as much as 1.2 billion euros by 2020. Already the world’s largest producer of nickel while also boasting significant high-purity reserves, few if any miners stand to gain more from EV demand than Brazil’s Vale SA. And if customers start lining up soon enough, that may help save the company’s struggling South Pacific mine. Vale has said it expects the EV revolution to boost battery market nickel demand to as much as 700,000 tons in 2025, from just 36,000 tons this year. When Chief Executive Officer Fabio Schvartsman took over last year, he lamented how poorly the base metals division, particularly nickel, was performing. Vale’s New Caledonia nickel mine stood out as the clear loser, and he threatened to shutter it. Then the market shifted, nickel and cobalt prices rose, and the possibility that New Caledonia’s high-quality ore might someday fetch premium prices caused Schvartsman to soften. Vale also spoke with Chinese customers focused on electric-car production, and a new outlook formed. Vale already generates billions of dollars selling high-grade iron ore to China, the world’s largest steelmaker. If that country continues to promote EVs, the Brazilian miner could reap similar rewards. Nickel prices have been falling since reaching almost $16,000 a ton in June. That is sour news for any producer, but Vale says it suffers even more when selling its high-quality ore to stainless-steel customers satisfied with lower-quality material. However, battery production requires a higher purity product, and the Rio de Janeiro-based miner hopes for a price upheaval mimicking that for iron ore. With nickel units in New Caledonia and Indonesia, the company is geographically aligned to supply a market driven by battery hubs China, South Korea and Japan. And the future isn’t just nickel. In June, Vale signed a $690 million streaming deal for cobalt that could be a benchmark for automakers and battery makers needing a steady supply to keep EV assembly lines busy.